Explanation: Spiral galaxy pair NGC 4567 and NGC 4568 share this sharp cosmic vista with lonely elliptical galaxy NGC 4564. All are members of the large Virgo Galaxy Cluster. With their classic spiral arms, dust lanes, and star clusters, the eye-catching spiral pair is also known as the Butterfly Galaxies or the Siamese Twins. 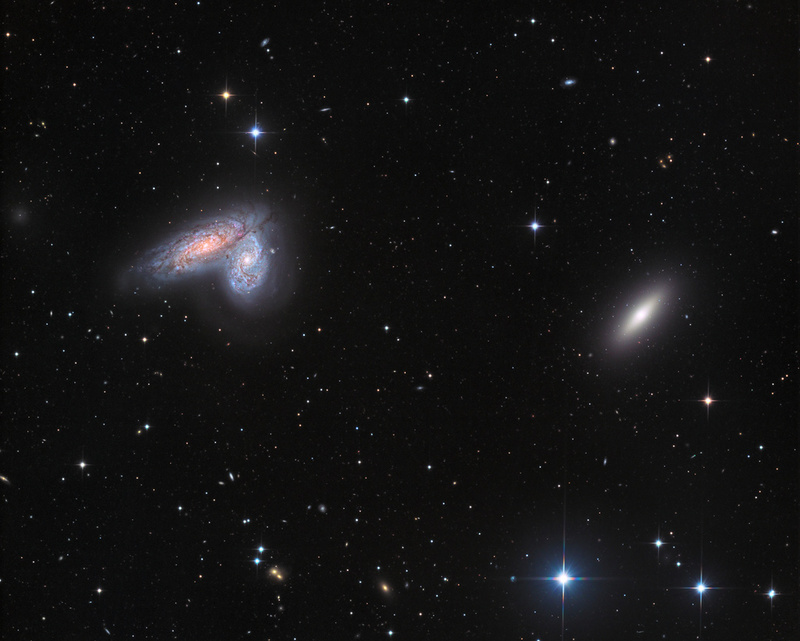 Very close together, the galaxy twins don't seem to be too distorted by gravitational tides. Their giant molecular clouds are known to be colliding though and are likely fueling the formation of massive star clusters. The galaxy twins are about 52 million light-years distant, while their bright cores appear separated by about 20,000 light-years. Of course, the spiky foreground stars lie within our own Milky Way.